This slow smoking of the jalapenos peppers create a chipotle powder that imparts a wonderfully smoky & spicy flavor to whatever it is added to. Chipotle powder has a long history of use in traditional Mexican cuisine and in recent years has become commonplace in the United States, especially the southwest. Are you celebrating Valentine's Day at home with your sweetheart? In a skillet, heat oil over medium heat. Saute onions and bell pepper, until tender. Add corn, salt, pepper and chipotle powder, stir, cook until corn heated through. Enjoy! Its not celebrating kind of celebrating but Yes I am spending my evening with my husband and daughter. I love fiesta corn Christine and I really like the chipolte powder, I've not tried that, sounds tasty. I love Chipotle Powder! Happy Valentines Day! It looks really appetizing ! Love the color and flavor combination ! oh yum that looks so good! I love the colors so pretty! I threw out some chipotle powder because I thought it was too old. Now I need some to try this recipe. yum, this looks like a simple and delicious side dish! I love the kick added by the Chipotle powder! Yum, this looks like a delicious side dish. I have some chipotles that could definitely be ground down--great idea! Great addition of the chipotle powder to this great recipe! This does sound like a great way to add some zip to corn. I do not have a big variety of corn recipes, but this does look well worth trying. Great info on the chipotle powder, I really had no clue what pepper it came from! Enjoy the day! As you know, I prepare a lot of fish. This would be great with fish. Thanks for posting! 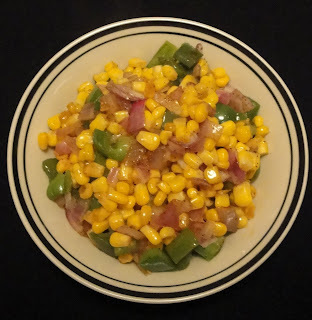 I love anything with corn in it, this would be a great side dish it goes with a lot of other dishes. What a great side dish for Taco night! I will have to remember this one! Thank you all for stopping by. I just love hearing from you. Y'all make my day.